Console gamers will finally have the chance to play one of the most critically acclaimed PC titles of all time. 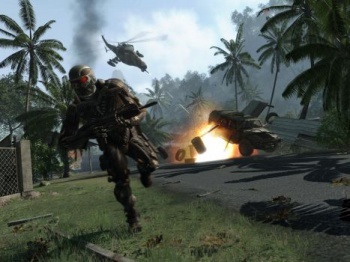 Following rumors about a console release two months ago, developer Crytek has revealed that the original Crysis will be released on the XBLA and PSN in October 2011. The full game, featuring updated lighting and a re-vamped nanosuit, will cost around $20. "We have been secretly working on [a console release for Crysis] for a while," said Crytek CEO Cevat Yerli in an interview with GameTrailers.com. He added that fans of the series have been asking about a console release for "years" and that the game, in his opinion, looks "just awesome." The "updated" Crysis will feature enhanced lighting, new special effects and "all-new" controls for the protagonist's nanosuit. The Xbox 360 gameplay footage in this announcement trailer certainly looks very pretty too. If your PC is anywhere near as feeble as mine, you too will have missed out on the critically-acclaimed Crysis the first time round. Back in 2007, it achieved its unrivalled level of visual splendor by demanding serious performance from PCs; the only question that remains is how Crytek will manage to retain that level of visual refinement on lower-spec consoles. That being said, Crysis 2 wasn't exactly ugly. Even if it means reducing some consoles to hyperventilating messes, it'll be still be worth it.